Tilly was first up, pretending to admire the sunrise, but I think the dawn chorus was more appealing to her sat in her curtain hammock. No dashing away, but no dillydallying either this morning, we had a proper days cruise ahead of us. Plenty of layers on to keep warm. Swanley Lock 1 was just ahead and we soon made it down the two locks and wound our way back towards Hurleston. At Bridge 4 Mick was a spoil sport and wouldn’t let us moor. The signs to Snugburys made me plead with him. A third visit would mean a much more considered choice of chilled medication, but he wasn’t having anything of it! On the moorings NB Higgler sat waiting for it’s crew of Old English Sheep Dog and Corgies, bet they’d been allowed medication! This was really the first boat through the bridge yesterday, before it was officially opened. They had passed us at Wrenbury on Saturday and must have been waiting for the dam to be removed and waved on. Traffic cones stood on ether side of the top lock at Hurleston. Two chaps then walked across the lock wheeling wheelbarrows! It looks like the lock cottage will be having an extension this year and two chaps were busy with the ground works, everything having to be carried across the lock. They lifted their walkway to let us into the lock and put it back again as soon as Mick was out of the way. So far they’d had to move it only three times, but they certainly weren’t looking forward to the start of the boating season, I suspect it could add a month to the build schedule. We worked our way down and soon we were being followed by another boat. 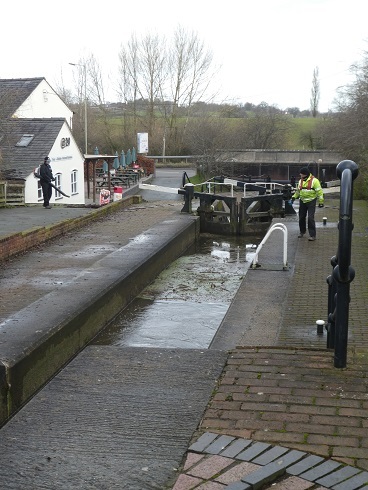 New ladders were evident at the second lock, not having had chance to get discoloured yet. The last lock, the narrow one, we took slowly, only lifting one paddle to empty the water, keeping an eye on Oleanna descending, not wanting to get stuck. There were signs of the investigation works that were carried out in November to see if a total rebuild is needed. Then with the bottom gates open, that was our time on the Llangollen over. We’d headed up the locks on the 17th November and have enjoyed our last two months immensely, but we are looking forward to being in a big city soon. Mick turned Oleanna left at the junction and waited for me to cross over the bridge and join him. We were now back on the Shropshire Union Main Line, it suddenly got busy! We’ve got so used to only seeing one boat moving a day that all of a sudden it felt like we were on the M25! The first bridge hole and there was a boat coming towards us. Blimey where had all the traffic come from? Well three boats. Being back on the Shroppie I made sure my camera was handy for all those kingfishers. Not long to wait as one flashed it’s blue back at us just before Barbridge and then obliged by sitting in a tree as we passed. A brief pause for lunch before the junction and then we topped up the water tank and dealt with rubbish at Calveley. Arriving at Bunbury we were a bit disappointed that we’d not be able to do the shuffle, no other moving boats in sight. This is our first wide lock since we came down from Wigan last year (that’s if you don’t count Big Lock in Middlewich). So much water, so much space, huge and heavy! Quite a shock to the system really. Bunbury is a staircase of two wide chambers, so you can fit two boats in at once. Should a single boat want to be going in the opposite direction they can enter the other chamber, the water is then moved from top to bottom, the central gates opened, then the Bunbury Shuffle can take place. One of the two boats moves into the gap in the other chamber, the single boat then moves into the new gap, the third boat into the next new gap. Gates closed and boats carry on up and down at the same time. Another lock was worth doing today and as we approached Tilstone Lock we could see a boat that we thought was waiting, we could share! But no they were moored up. However at the lock there was activity, a boat was coming up. Such a busy world! I recognised it as a Carefree Cruising share boat and chatted to the lady. It was only their second week out and they were loving it, apart from the tent that they’d picked up around their prop yesterday which meant they didn’t have long to explore Chester. We pootled along the wide canal, it felt like a river after being on the Llangollen for so long. Above Beeston Stone Lock we took advantage of the 48hr moorings and pulled in for the day, letting Tilly have the last hour of daylight to stare at the little twitches coming from the ivy clad hedge next to us and to practice her pouncing. We’ve been this way twice before back in our share boat days, so somethings we’d forgotten about. The lovely little pepper pot buildings at the locks, the wideness of the cut, however we had remembered the total lack of phone, internet or TV signal by Stone Lock. Oh well that’s more we’ll have to catch up with on the internet, hope EE reset out allowance early again! 9 locks, 8 miles (rounded up), 1 left, 1 straight on, 1 tasty looking robin, 1 stunning sunrise, 10 minutes that’s all, 0 chilled medication, 1 big meanie Mick, 1 kingfisher, 5 moving boats so busy, 0 boats to shuffle with, 1 mooring close to road and rail, 0 signal of any sort! 0 map. This entry was posted in Uncategorized on 31st Jan 2018 by pipandmick. The water gauge was showing half a tank this morning so just in case we ended up sitting around a while longer waiting for the bridge ahead to open we decided to visit ABC boat hire at Wrenbury Mill to top up. The forecast was for rain this morning, but it would stop between 11 and 12 midday, so when the rain had stopped for a while we pushed off and headed to the lift bridge. As I turned the key of power in the panel it started to drizzle, then rain, then drizzle, good job we’d put on our waterproofs. Four cars and a dog walker held up, Mick swung Oleanna into the gap between boats moored up at the Mill. The hire base was busy, a delivery of new mattresses was being moved on board the boats. For the use of their tap we’d been quoted £3 but when it came to ringing it into the till it said £2, £2 well spent for peace of mind. We reversed out managing not to leave any marks on the newly blacked hire boat we’d breasted up to, then we turned towards the last lift bridge of the Llangollen Canal. 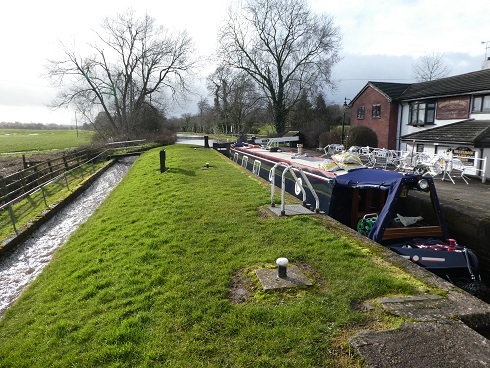 Once through we waved goodbye to Wrenbury. Our aim for today was a 48hr mooring just before the closed bridge, from here we’d hopefully be first through once it opened. In places the water table was higher in the fields alongside the canal than it was in it. Plenty of rain had fallen overnight, today in parts you would need water wings to walk the towpath! All three locks lay empty before us, but all the paddles are easy on this canal, so it didn’t take much effort to fill them for us to go down. As we waited for the final one to fill I could see a gang of high vis heading in our direction. Nine or ten chaps were walking the towpath heading towards the closed bridge. Could it be that they had had a lunch break and were heading back to carry on with repairs? If so then they certainly were throwing men at the job. Or could it be that this was the clear up team? The works were complete and they were here, mob handed to remove the pumps and damns. We pootled along behind them and pulled in to tie up. It looked like the navigation was open, certainly no dam across the bridge hole. Just as we’d stopped Oleanna, and Mick had stepped off to tie up we were give a wave on by one of the chaps. It took a bit of effort to get Oleanna away from the side as the wind was pushing her in. We thanked the chaps as we passed, one saying that we were the first boat through. Another fella stood tapping something into his tablet as we passed, wonder if that was the Notice Update saying that the canal was now open, it popped into our inbox three minutes after we’d gone under the bridge. The scaffolding supports of a dam sat on the extremely muddy towpath, the tarpaulin sat on the back deck of a work boat. A huge yellow pump and giant pipes filled another boat. As the Llangollen Canal feeds a reservoir that serves Crewe and Nantwich the flow cannot be turned off on the canal, it is really a bit of a river. So when a damn blocks the navigation the constant flowing water has to be taken around it. Quite glad we didn’t have a couple of days moored near the big pump going 24 hours a day. Once through the bridge Oleanna proceeded to go aground, right next to the workboats! A good blast of reverse and one chap pulling on our centre line got us free and we slowly inched our way past them. As soon as we had cleared them boats were moved, blocking the bridge again so that they could get all the pipework back on board. We’d timed our arrival perfectly, even though we expected to have a two day wait. Pushing on a short distance further, we pulled in just before Stoneley Locks and retired inside for a very late lunch. There is a ten hour cruise ahead of us to reach Chester, so we should be able to meet up with our friend Sue and have a drink with Bridget and Storm too. Perfect. Thank you C&RT. 3 locks, 3.73 miles, 2 lift bridges, 4 held up, £2 water charge, 1 quagmire, 10 yellow and orange clad chaps, 0 damn, 4 work boats, +15 lengths of giant pipe, 3 minutes before it opened, 2 days ahead, 4 seriously muddy paws, 1 chimney sweep tail. This entry was posted in Uncategorized on 30th Jan 2018 by pipandmick. Saturday morning we had breakfast and then moved Oleanna closer to Wrenbury, not far but past the worst bit of muddy towpath. Whilst Tilly went off to explore her new estate Mick walked into the village for our Saturday newspaper where it was sat waiting for him behind the counter. 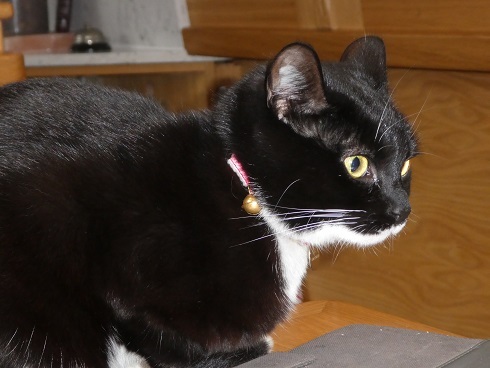 Whilst Tilly surveyed her new surroundings I kept the stove top busy, first a pot of Sweat Potato Soup, followed in the afternoon by a pot of Tarragon Chicken which simmered away for five hours. Both were yummy but I think next time I do the soup I’ll try making it with just paprika, not smoked as this was a little over powering. In between chopping and stirring, I made a start to a rug for in front of our stove. Using the fabrics I’d covered the tops of our stools with I came up with a pattern and began to crochet. Our bilge pump has been being a bit active of late. The cause isn’t because the engine bay is full of water (it is as dry as it should be) but it seems that the pump likes the sound of itself, every 2min 30 sec! Quite annoying really. When it started doing this a week a go Mick tried various things finding that when he disconnected it, then reconnected it, it stopped being vocal but still worked. But today this didn’t work. So with Tilly safe inside having a snooze Mick climbed down into the engine bay to see if the pump had got gunged up. I could so help with things down in the box under the boat. I’d be able to reach all those awkward places that Tom can’t and bat things that had been dropped around until he could reach them again. But he doesn’t seem too keen on the idea. Whilst contorted around the engine he noticed that the fuel gauge had become disconnected, so dealt with that, no wonder the gauge didn’t have a reading. Then he took the bilge pump out of it’s holder and gave it a clean hoping that this would do the job. Sadly the effort had not been worth it as the pump was still being vocal. This may have to be added to the Finesse list when they come with our batteries. Sunday morning we woke to the sound of a wood pecker giving itself brain damage nearby. This used to be the first sign of Spring that we’d hear from our house in Scarborough. A beautiful morning just right to go for a walk, but first we decided to have a cooked breakfast with Turkey sausages to keep it remotely healthy. When Tilly eventually returned we quickly got ready to go out ourselves. The aim of our walk was to see what lay ahead where the stoppages are and have been. Not using our common sense, or heeding from Carols experience on the Thames we decided not to put our walking boots on and ventured off wearing trainers! They were old ones. Just after reaching the swing bridge we saw our error as a sea of MUD stretched out in front of us. Back tracking a little we detoured along the road and through the church yard back to the towpath. Here the going was still sticky but passable. The next stone bridge was where a large tree had given up it’s fight against the forces of gravity in a storm blocking the navigation recently. The trunk had been cut and cleared. Much of it must have been put through a chipper, the chips/chunks left on the towpath creating a tree beach. On we walked, out of the breeze it was really quite warm and hats ended up being removed. Mud occasionally took over and one stretch of sticky sea made us divert to the nearby road again, through a hedge. The first of the locks came into view, empty. Below the second lock was the boat and butty that had been sold a week or two ago. 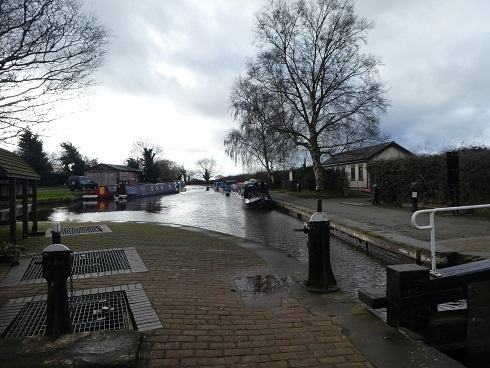 We wondered if they’d been aware of the next lock being closed when they’d set off from Grindley Brook, but they’d got as far as they could as Lock 3 had only reopened on Friday. A boat was making it’s way down in the chamber, so we went to help close gates, they soon pulled in below as half a mile further on is where the bridge was still closed. We considered walking further, but as our walk had been delayed (nobody said which hour and a half I could be outside for!) we wanted to get back in day light so turned back, knowing that there would be plenty of space for us to moor for a couple of days. A return along the road made sense, calling in at the Spar shop for a few bits of veg. Next call was at the Cotton Arms to see when they served food until. But as we stood at the bar the plates of Sunday roast twisted our arms, so we decided to stay and eat instead of coming back later. A quiet pub with quite a few eating or drinking. A good selection of beers too. Only thing was there was no sign of a menu. Mick asked if they were doing a roast today, a choice of four meats. Two beefs, luckily I’d spotted that most plates were swimming in gravy so asked for one with little gravy. Apart from the food being a little tepid it was very nice. The dessert menu called out to us, well we had walked and waded quite a distance. I had ginger pear and salted caramel sponge whilst Mick had sticky toffee. Both were very nice and warmer than the main course. It had been a good decision to stop. The sun was setting as we returned to Oleanna which didn’t impress Tilly as she wasn’t allowed out again. 0 locks, 0.39 miles, 1 bridge lufted, 1 newspaper, 4 bowls of smokey soup, 2 chicken thighs, 6 hours, 1.5 hours a joke! 5.8 mile wade, 1 telepathic pub, 2 roast beefs, 2 sponge puddings, 2 pints, 150 seconds, 2 rows short of a rug. This entry was posted in Uncategorized on 29th Jan 2018 by pipandmick. What a lovely day, sunlight streaming in through the windows, Tilly found a very good spot on the Houdini shelf to have a good sunbath. As we had breakfast a number checker walked past, we wondered how far they have to walk each day. This chap was obviously absorbing the wonders of nature all around him as he walked the towpath with his music blasting out! The weather was so perfect for cruising, just a shame we couldn’t go far! Not too many extra layers were needed as we cruised along in the sunshine. Approaching Marbury Lock it felt as though we should be about to go up the lock as all around us there were hills. But rounding the last bend the landscape dipped away in front of us and the lock followed suit. 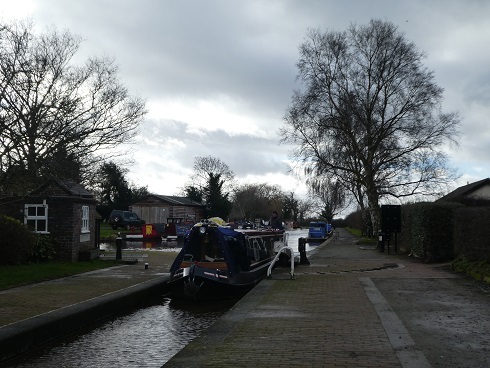 There are another three locks ahead of us before reaching the bridge that is still closed, but we have decided to loiter around Wrenbury for the weekend where we can get supplies. So we pulled up on the last 48hr mooring before Wrenbury, just in case there was no space closer in. After lunch and an explore around a turnip field for Tilly we walked up into the village checking for spaces as we went. Despite not being far away the towpath in places is so muddy it is really quite hard work, so we are likely to move up a bit tomorrow. More signs of the seasons moving on today as we passed the church yard. Masses of snowdrops hung their heads between the gravestones and the tall green stalks of daffodils are reaching for the sky everywhere. A few bits bought from the shop and a reserved copy of our Saturday paper and we were sorted. The printer this afternoon has been busy as it’s that time of year when we have to declare ourselves homeless. To be able to vote in Scarborough we have to declare a local connection, but as our house is rented out we have to be homeless. We could be registered at my brothers, our contact address, but we’d rather our votes count in Scarborough than London. 1 Lock, 2.65 miles, 1 bridge closed then open, 1 sunny sunny day, 1 field of turnips, 1 paper on order, 80p of mushrooms, 2 homeless boaters, 1 new contract, 0 graveyard cat, 1 moonwalking cat, 2 fingers crossed that livewriter is working! This entry was posted in Uncategorized on 26th Jan 2018 by pipandmick. Time to push off, first of all backwards! Well the water tank needed topping up. Once the tanks were done we pushed back off and headed forwards. Up at the staircase there were a couple of C&RT chaps busying themselves, one with a very noisy leaf blower the other was emptying the chambers trying to clear the build up of detritus in them. He signalled to fill the top lock the bottom gates slightly ajar. Usually the rising water pushes the gates closed, but this didn’t seem to be happening, a six inch gap still between them, so I dropped the paddle with the hope of freeing what ever was causing it. We tried opening and closing the gates, but it wouldn’t shift, the Lockie kept indicating to open the paddles, so we did. Gradually the gates made an effort to close, but it was painful to watch. Apparently the collar around one of the gates is ever so tight and the gate will only close with a lot of water pressure. This might explain why we’ve seen the Lockie on several occasions filling the top chamber and leaving a paddle up to keep the pressure on the gates. At 11.30 Mick brought Oleanna into the top chamber and we started to work our way down the staircase leaving the Ellesmere pound that we’ve been in for almost three weeks. The Lockie helped work one side of the staircase and offered to close it up after us so that I could walk on to open up the next lock in the flight. The next three locks got us back into the swing of things, Mick closing the gate behind him and lifting a paddle whilst I went ahead to set the next lock. Over the last few weeks we’ve often wondered if the flow on the canal had been slowed, today there was no suggestion of this as all the bywashes were brimming full. Despite these Mick managed to stop Oleanna in the mouth of each lock to push the off side gate closed with the boat hook, saving me a walk round the lock. Below Grindley Brook it was good to be moving again with blue in the sky. 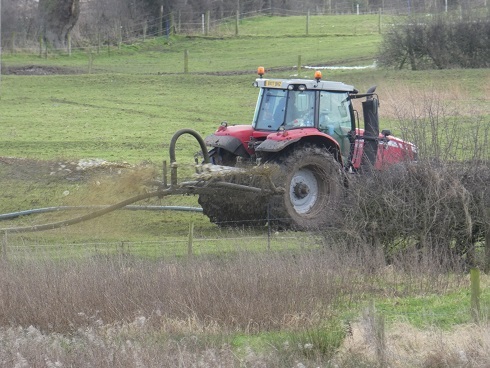 However the smell of the countryside hit us, assisted by a farmer spreading muck in his fields. A short distance on there were more signs of spring on it’s way. As we pootled along we could hear bleating. 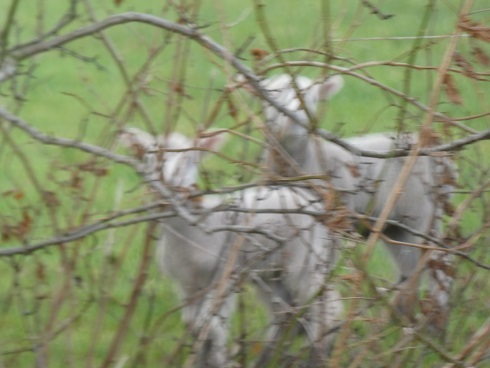 Behind the hedge we could just make out the shapes of lambs in the fields. None of them gave us a display of bedoyinginess but all seemed to answer to my bleating back at them. 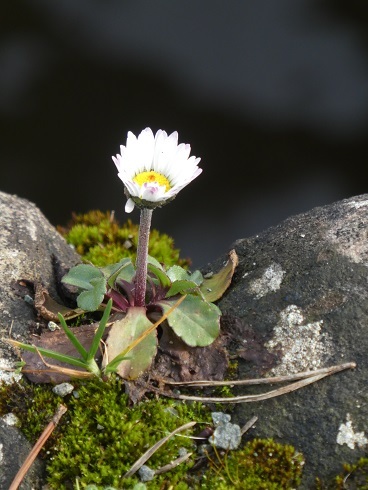 In between the stones of Povey’s Lock a solitary daisy was searching for the sun which was obliging us with it’s presence. Sat by the lock was a pile of railings waiting to be erected for the forthcoming closure in February. Mick here had great difficulty in closing the bottom gate, in fact he couldn’t. Just as I was setting off to walk round, up ahead the bow of a boat appeared followed by another, Bingo we could leave the gates open! It was two Viking Afloat hire boats that looked like they had been for a repaint and were returning to base piloted by their staff who were not hanging about! After Willey Moors Lock we decided that we’d stop for lunch, maybe even for the day after the next lock. The A49 runs close to the canal, so we’d carry on until it headed away from us. 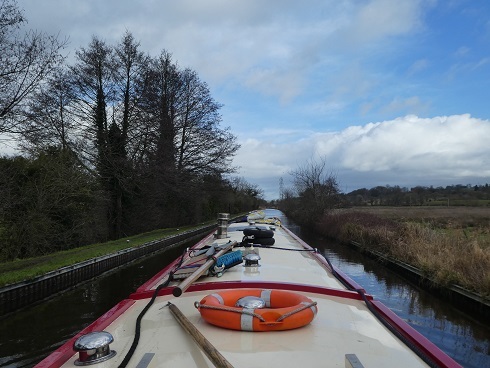 By the time we’d descended Quoisley Lock the wind was picking up and a very black cloud was gaining on us. A handy 48hr mooring appeared and we pulled in just as the heavens opened. Sadly by the time we’d fought with the wind and got the pram cover up we had both got a touch wet. This however didn’t stop Tilly once the door was opened up. There being more trees and friendly cover here she has been kept amused for most of the afternoon. Our timings to reach the closed lock were looking good and we’d just decided to stay in Wrenbury tomorrow night (so we can get a Saturday paper) when a C&RT notice dropped into our inbox. The stoppage at Halls Lane Bridge 12 (which was due to open tomorrow too) has had to be extended by five days to complete the works! So we shall saunter towards Wrenbury and hope that should we need more water that the hire base there will look kindly on us. Hopefully we’ll be on our way again on Wednesday and do our best to reach Chester as quickly as we can as a friend of ours is there next week on tour with a show. Fingers crossed for no ice. 9 locks, 2.82 miles, 1 Lockie, 1 full water tank, 1 empty wee tank, 0 leaves on trees, 23 lambs, 1 daisy, 2 boats moving, 2 damp boaters, 1 happy cat, 5 days extension, 1 vintage episode of Coronation Street, 0 map possible! Grrrrr!!! This entry was posted in Uncategorized on 25th Jan 2018 by pipandmick. On Monday just as we finished our late breakfast NB Mountbatten came past towing Jellicoe. 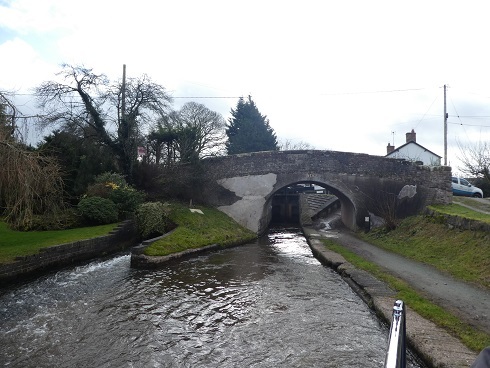 They have paid for a winter mooring in the Whitchurch Arm up to Easter but hadn’t known that the arm would be closed off when New Mills Bridge is being worked on. 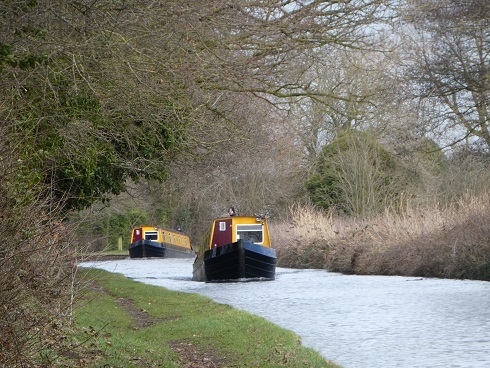 After a few days at Grindley Brook, whilst Richard did the last coal run by boat (before the stoppages really get going), they had decided to return to the arm otherwise it would be wasted money. Their water would now need to be collected by van. We said our goodbyes as we doubt we’ll be seeing them again this winter. Soon after we made our own move, lifting the bridge for Oleanna to go through I stayed put and hoped that no body would want to cross the bridge whilst Mick headed up to the winding hole to turn. A couple of walkers arrived but luckily for my arms Mick did too, once through I wound the bridge back down. 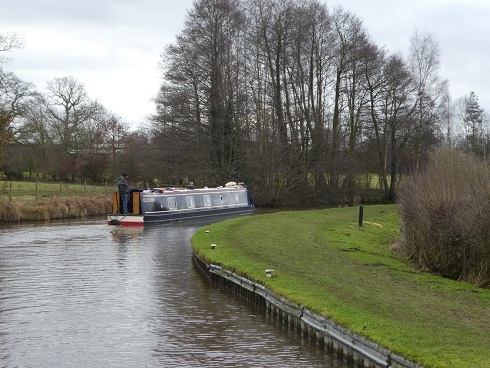 On we pootled back to Grindley Brook where we pulled up at the nearest end of the visitor moorings. There was a boat reversing back from the services which looked like NB Myrtle. They have a cat on board, so we hung back so as to give Tilly and their cat a good range between their homes. Tuesday came along with the next engine service. So after Tilly had a bit of an explore she was locked inside for a snooze whilst Mick climbed down into the engine bay (on his own) to change the oil and filter. I could have just sat around in front of the stove knitting all day, but now that my tax return was done there was another job I’d been meaning to do for a while. The shower. 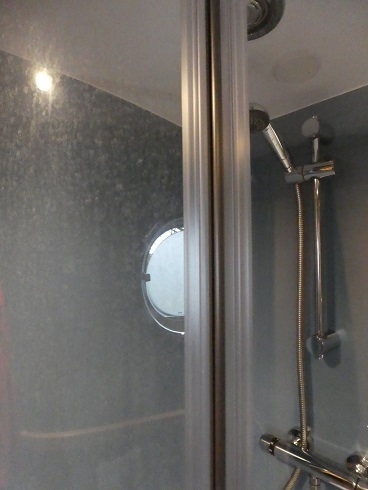 On Lillian (our previous boat) the shower glass was frosted so didn’t show the gradual build up of lime scale and general soapyness. 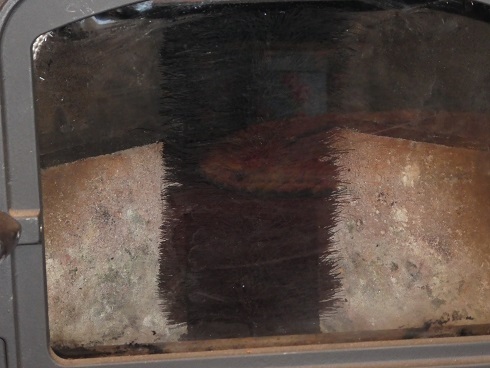 Oleanna’s however is clear and shows where every little drop of water has rested. I decided to give it a very good clean which included taking the doors off. Lillian needed two people to do this as the rollers and catches were tricksy. On Oleanna you just need to push the buttons on the bottom rollers so that they clear the lower track and then lift the top rollers out from theirs. With both doors laid carefully on the bed I gave the main cubicle a good clean, I also removed the ever growing hair monster from the plug trap. Pleased with my efforts I brought each door back in turn to clean. Blimey! 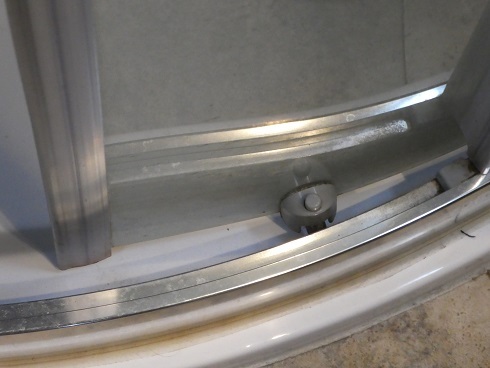 Can you get repetitive strain from cleaning shower doors! The outside was easy, but the inside took several goes to get reasonable. Standing in bare feet with jeans rolled I started to smell like a highly vinegard fish and chips. The best thing I’ve found for removing the build up is diluted white vinegar, which we use in a spray bottle to keep the urine separator clean on our compost loo. The second door I made the mix stronger as my life and arms were starting to prefer the cloudy effect on the doors. I persevered, maybe I shouldn’t leave it quite so long next time. Mick in the meantime had finished the engine service and moved us up to a water point to fill the now nearly empty tank. Once this was done we moved up a bit further to moor between the pump out and water points again as the night was due to be windy again. The roof was cleared of anything loose and a spring line was added to the stern to keep us into the side should the wind be bad. Overnight we were aware of the odd gusts, but nothing compared to last weeks storm. A bit of a disappointment, it did mean that we slept quite well. 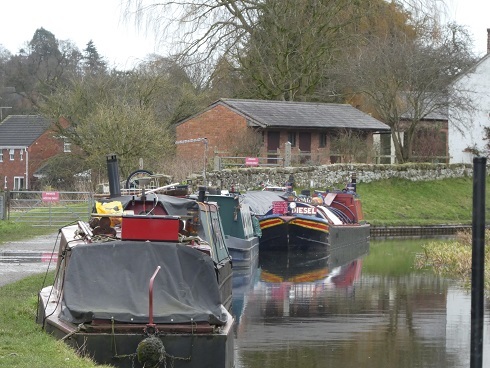 Our original plan was to leave Grindley Brook today, down the locks and start making our way towards Baddiley Lock 3 which is due to reopen at the end of Friday. Once through there we should have a clear run to Chester and be free of stoppages. No more waiting around. But this morning we still had strong winds and plenty of rain, not so nice. So instead of pushing off we put our coats on and headed to the Lockside cafe for a cooked breakfast. 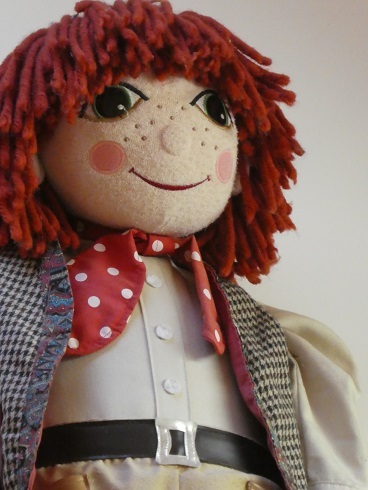 A large Rosie and Jim looked down on our sausage, bacon and scrambled egg from high on the wall next to us. Rosie’s feet swayed alarmingly, caused (we hope!) by the rising heat from the radiator below. 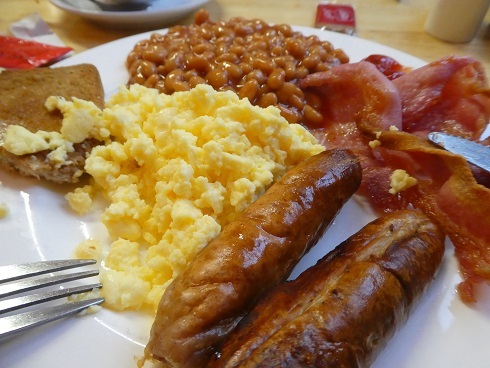 The breakfast was nice, but the sausages were nothing to write home about, more like a Holiday Inn banger. We’d let the fire go out overnight, not wanting the wind to make the fire run away with itself. Now fortified after breakfast Mick gave the chimney a sweep and good hoover out. His Christmas present of new black gloves coming in use for the second time in two days, he’s impressed with their performance, Thank you Josh. Tilly was given the freedom of the towpath for the day, but I preferred to stay indoors and watch the hoover from a safe distance, followed by pummelling Toms hat and trying to get those balls out of the box of holes, they really shouldn’t be in there! We’ll wait just one more day, but tomorrow no matter what the weather we need to push off. You may notice that the layout is a bit different today. For some reason livewriter wouldn’t upload my post with photos in it (we’ve been trying most of the day!). So I’ve had to return to inserting them on blogger, which I find most annoying!!! 0 locks, 0.78 miles, 1 lift bridge, 1 wind, 1 wave goodbye, 1 good mooring, 1 not so good mooring, 182 stitches, 48 tv channels, 1 full water tank, 1 empty wee tank, 2 loads washing, 1050hr service, 1 spotless shower, 2 pickled feet, 1 spring line, 2 windy to move, 4 sausages, 1 dangling leg, 1 chimney swept, 2 windy for my bottom, 1 big sulk! 1 blogger getting quite p**d off, 1 tech support also getting p**d off, 1 more night before the off. This entry was posted in Uncategorized on 24th Jan 2018 by pipandmick. Saturday morning we headed out to top up the food supplies and get our Saturday newspaper. We walked the road into town as the pathways looked like they would be rather muddy and icy in patches. Cutting through Jubilee Park we came out near Colour Supplies, the Whitchurch version of Boyes. Somehow in the last week our dustpan has lost some of it’s rubber lip which means that it is neither use nor ornament, so we wanted a replacement. Next it was time to choose which charity shop could have some bits and bobs donated to them, this done we wandered up the High Street to find a butcher that would sell us a joint for Sunday. By now it was snowing so we called into Sainsburys and then made our way back to Oleanna. The Whitchurch arm looked a little bit icy now with a layer of snow sitting on the surface. We wondered how ducks had walked in such a straight line across the surface at the winding hole, but as I noticed a drip from above the penny dropped. Not ducks feet, but telephone lines dripping! The boat that had been behind us had moved off whilst we were out, so Mick pulled us back hoping that this might improve our TV reception. It didn’t! But Tilly had a slightly different patch to explore for the rest of the day, returning with very muddy paws. We now have towels to cover the dinette and sofa on such days with the hope that they may stay reasonably clean. However a paw bath across the stern and some highly absorbent matting wouldn’t go amiss. Well it’s exciting out there and I need to run around reliving my exploration and telling them all about it. Sometimes the best place to do this is on someone’s knee or newspaper! Sunday came with sleet which then turned into quite large chunks of snow. The only one to actually step off the boat today was Tilly and she wasn’t too enamoured with it, returning quite quickly on numerous occasions. I had to keep checking on the outside as you never know things might have changed. The snow turned back into sleet and then rain, making the towpath even more sticky, sloshy and slushy. We got a touch bored of opening and closing the back doors for her! 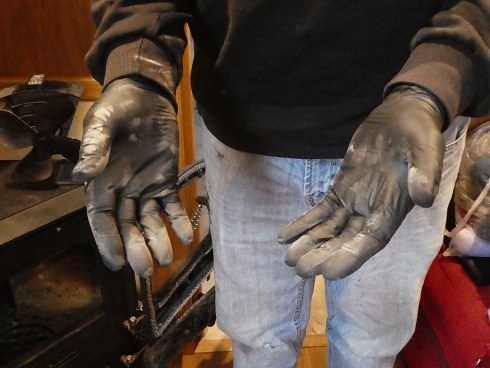 I bet Richard on NB Mountbatten was glad to be on the home straight from doing his latest coal run. All cosy inside I set about finding a few more knitting patterns to keep my fingers busy. 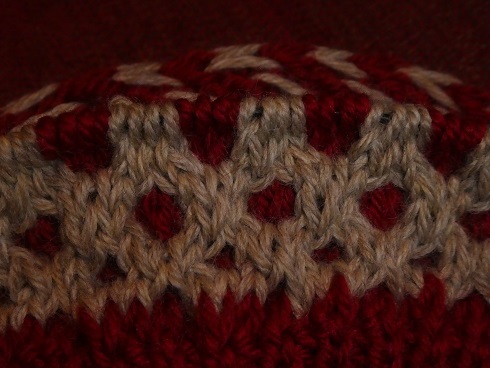 The pattern I decided on involves some cabling which I haven’t done for a long time. When we were downsizing our possessions I went through all the knitting needles I owned (a lot!) and put together a full set of sizes, donating the remainder to a charity shop. Sadly amongst my set there was no cable needle (a needle with a V in it to help pass stitches to the back or the front of others), but after a bit of thought and looking around on the internet I realised that I could do without, using either a stitch holder or a straight double ended needle. I also learnt a new way to cast on which gives a stretchy edge, useful for hats and socks. Meanwhile after Mick had finished reading the paper he decided to have a go at installing one of his Christmas presents. I’d bought him an Alde Discrete Room Temperature Sensor for our boiler. The thermostat is currently in the electrics cupboard which tends to be one of the warmest places on the boat (other than in front of the stove), so not a true representative of general temperature in the cabin. With a cable of around 1.5m his aim was to pass it from the control panel in the cupboard behind the larder drawers in the galley and out the other side. First we had to sus out how the drawers came out, a little catch on the runners, one pushed up the other down and bingo space too work in. But would the cable get fouled by the drawer and it’s contents? Theatre Designer mind was engaged as boy looking wasn’t finding a solution. 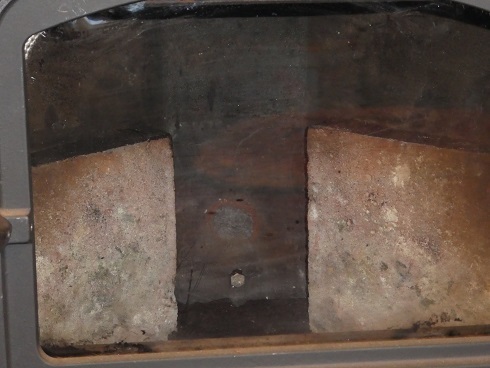 A route through avoiding the boiler flue, not totally ideal, was found. From the control panel (A) the cable needs to pass through a gap with many others (B) to just under the inverter (C), here it can pass through two layers of 18mm into the top cupboard, then straight down into the space below where the drawers are (D but towards the rear of the cupboard). From here it can run along the underside of the cupboard and come out through a hole to a discrete position in the galley (E). There is enough cable for the run, but sadly we don’t have a suitable sized drill bit to be able to do it with! So the job was put on hold for the time being, at least one drawer got a good tidy and clean out. Our joint of roast Pork with all the accompaniments was just the right way to round of a truly miserable weekend, aided by a couple of glasses of wine. 0 locks, 100ft backwards, 2 wet sleety slushy days, 2 cold damp boaters, 4 cold muddy paws, 4 cat sized wellies required, 2 new patterns, 0 cable needles, 0 10mm drill bit, 3 things learnt, 1 tidy clean drawer, 0 tv signal, 1 chink of phone signal, 25th 26th April hmmmm! This entry was posted in Uncategorized on 22nd Jan 2018 by pipandmick.